The annual Perseid meteor shower is set to light up the skies over the UK on the night of 12-13 August. The new moon will mean a darker sky and perfect conditions (given clear skies) for one of the summer months’ most breath-taking spectacles. The Perseid meteors seem to come from a single point, the `radiant’, situated in the constellation Perseus, giving the shower its name. This is however just an effect of perspective, as the meteors move parallel to each other, much like drivers see when driving in heavy rain. The radiant will be visible from around 10pm and at this time there will be the highest chance of seeing `Earth grazing meteors’. These are meteors that skim the Earth’s atmosphere and so have long, blazing tails. Observers can expect to see a few tens of meteors per hour, or one every few minutes, once darkness has fallen on 12 August. The number of meteors will peak in the early hours of 13 August, when up to around seventy each hour should be visible. Meteors (also known as ‘shooting stars’) are small particles of dust, some as small as grains of sand, entering our atmosphere at high speed. The friction as they pass through causes the air around the meteor to heat up dramatically, resulting in a characteristic brief bright streak of light. Meteor showers occur when the Earth passes through a clump of debris in space, as our planet moves along its orbit around the Sun. The dust causing this shower comes from a comet known as Swift-Tuttle, which last passed near Earth in 1992 and orbits the Sun approximately once every 133 years. The meteor shower is actually the Earth moving into the dust and rock left by the comet, which will next come close to Earth in an extremely near miss in 2126. The shower will be visible all over the UK, as long as the skies are clear. Unlike a lot of celestial events, meteor showers are easy to watch and no special equipment is needed, although a reclining chair and a blanket make viewing much more comfortable. Most importantly it will help to be away from artificial light, so observers are advised to avoid built-up areas if possible, and to try to find an unobstructed view of the sky towards the east. 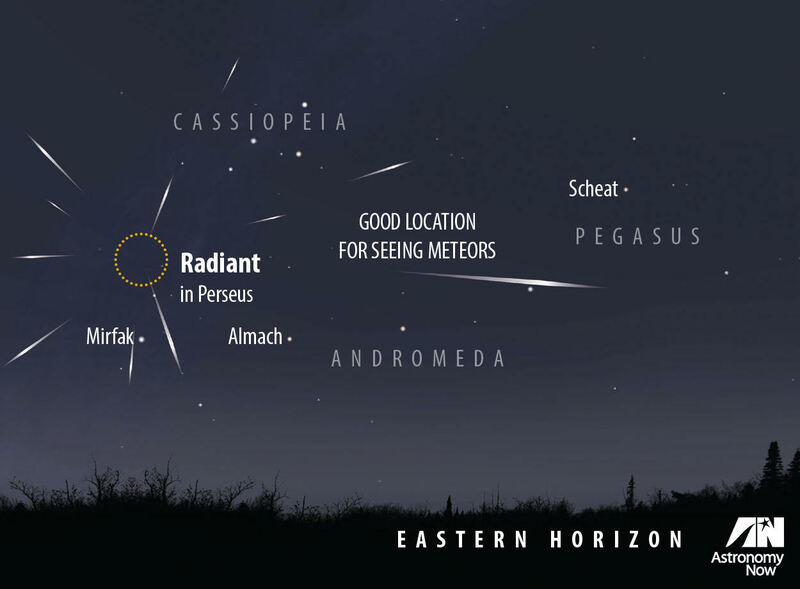 The Perseids are active from mid-July to mid-August, but for most of that time only a few meteors per hour are visible. So if clouds do make viewing impossible this weekend, the showers will continue for a few days more with reduced activity.